The size of Eris compared to Pluto, Makemake, Haumea, Sedna, Orcus, 2007 OR10, Quaoar, and Earth. Eris and Dysnomia. Eris is the bigger object, Dysnomia is the little circle above it. The Sun is the circle of light to the left. Eris is a dwarf planet and a trans-Neptunian object (TNO). Eris is the second-largest known dwarf planet in the Solar System. It is a "scattered disc object" and it is in the Kuiper belt, farther out than Pluto. 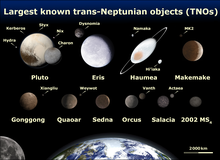 It is also called a plutoid because the IAU decided to rename all trans-Neptunian dwarf planets as plutoids. Eris orbits the sun once every 557 Earth years and it has an elliptical orbit, inclined at an angle of 44° between the plane of the orbit of the planet and the ecliptic, which is the plane containing Earth's orbital path. Eris has one moon called Dysnomia. Eris was discovered by Michael E. Brown, Chad Trujillo and David Rabinowitz on January 5, 2005, when they were having a close look at some images of the outer Solar System taken in 2003. Eris was originally called Xena, after the main character of the television series Xena: Warrior Princess. However, there is a rule stating that all objects orbiting outside Neptune’s orbit have to be named after a creation of mythology. Therefore, it was officially named Eris on September 13, 2006. Eris is named after the goddess of strife, discord, contention and rivalry in Greek mythology. Eris has one moon called Dysnomia. It was discovered on September 10, 2005. Dysnomia was originally nicknamed Gabrielle, after a character from the television series Xena: Warrior Princess, like Eris. However, like Eris, it could not be called this. Dysnomia was named after the daughter of Eris, in Greek mythology. Dysnomia is the goddess (or spirit) of lawlessness and poor civil constitution. Media reports have argued that Eris is the tenth planet, along with astronomers and NASA scientists. However, the definition of a planet was changed in August 2006. Under the new specifications, Eris, along with Pluto, was lowered in status to a dwarf planet. Scientists are continuing to find out more about Eris and its moon, and to look for any more moons and possible rings. Because Eris is so far away, it would take 24.5 years to visit Eris with a space probe. ↑ Lang, Kenneth R. (2011). The Cambridge Guide to the Solar System (Second ed.). Cambridge University Press. p. 442. ISBN 978-0-521-19857-8. ↑ 3.0 3.1 3.2 3.3 Harvey, Samantha (2011-03-24). "NASA: Solar System Exploration: Planets: Dwarf Planets: Eris". NASA. Retrieved 2011-03-31. ↑ Sicardy, B.; Ortiz, J. L.; Assafin, M.; Jehin, E.; Maury, A.; Lellouch, E.; Gil-Hutton, R.; Braga-Ribas, F. et al. (2011). "Size, density, albedo and atmosphere limit of dwarf planet Eris from a stellar occultation". European Planetary Science Congress Abstracts 6: 137–138. http://meetingorganizer.copernicus.org/EPSC-DPS2011/EPSC-DPS2011-137-8.pdf. Retrieved 2016-02-19. ↑ Harvey, Samantha (2011-03-24). "NASA: Solar System Exploration: Planets: Dwarf Planets: Eris: Facts & Figures". NASA. Retrieved 2011-04-04. ↑ Brown, Mike. "The discovery of 2003 UB313 Eris, the 10th planet largest known dwarf planet". Caltech. Retrieved 2011-04-04. ↑ 7.0 7.1 7.2 Brown, Mike. "Dysnomia, the moon of Eris". Caltech. Retrieved 2011-04-02. ↑ Atsma, Aaron J. "ERIS". Theoi Project: Greek Mythology. Retrieved 2011-04-03. ↑ Also with the provisional designation: 2003 UB313. ↑ Atsma, Aaron J. "DYSNOMIA". Theoi Project: Greek Mythology. Retrieved 2011-04-02. ↑ Whitehouse, David (2005-07-30). "Astronomers detect '10th planet'". BBC. Retrieved 2011-04-03. ↑ "10th Planet Discovered". NASA. 2005-07-29. Retrieved 2011-04-03. ↑ Hamilton, Calvin J. "Dwarf Planets". Views of the Solar System. Retrieved 2011-04-03. Harvey, Samantha. "Eris Profile". NASA. Retrieved 2011-04-03. Harvey, Samantha. "Eris: Facts & Figures". NASA. Retrieved 2011-04-04. Brown, Mike. 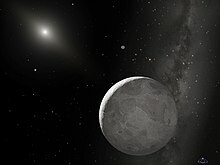 "The discovery of 2003 UB313 Eris, the 10th planet largest known dwarf planet". Caltech. Retrieved 2011-04-04. This page was last changed on 5 July 2017, at 03:45.